AJL Gustav Lundgren signature Model for sale! The Gustav Lundgren Ebony D-hole is a slight exception from the old Selmer concept. In terms of sound, black D-hole is based on the Standard Model-Jazz guitar, producing lots of volume in combination with a crisp high-end. The guitar has a 670 mm oval-hole scale-length, allowing 14 frets clear from the body. It has a laminated body with a black ebony veneer on the outside and a "flame" stripe in the middle of the back. 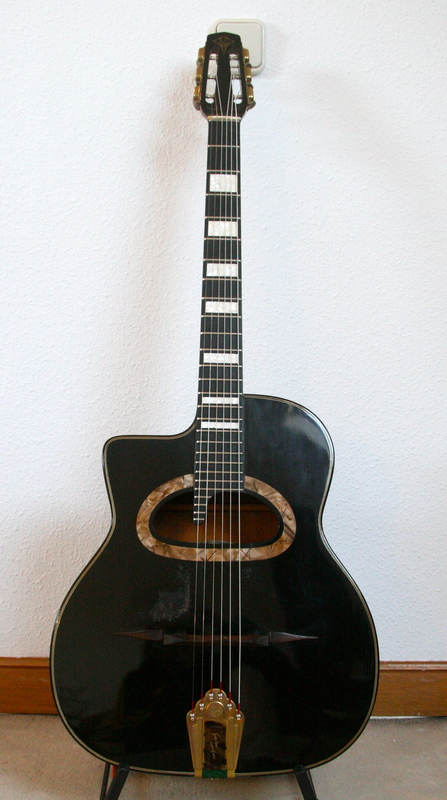 Brown "abalone" imitation is used on the rosette, tuners and tailpiece. Gustav Lundgren (guitar), Founder of Hot Club de Suede. He’s endorsed by AJL-Guitars (signature model http://www.ajl-guitars.com/custom.html ), AK picks, B-Band, Eastman Guitars and AER. That is the most awesome-looking AJL ever! Also: there is a AJL hard case and a B-band twin system incuded in the price!